Carica quinqueloba Sessé & Moc. Vasconcellea cauliflora is a usually unbranched small, evergreen tree with a main stem up to 3.5 metres tall. The edible fruit is gathered from the wild for local consumption. The plant is sometimes cultivated for its fruit. Northern S. America - Colombia, Venezuela; C. America - Costa Rica, El Salvador, Honduras, Guatemala; Caribbean - Trinidad and Tobago. Open areas and forest edges. Fruit. The fruits are not eaten raw. 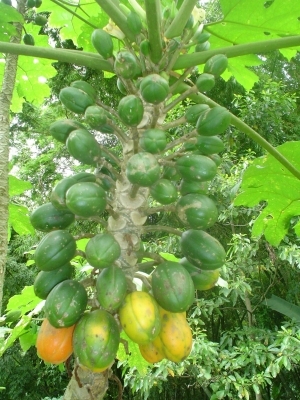 However, the pulp of papaya d montana fruits is used by local people for making candy, jams, cakes, and salted preparations. Sherbets are also made from the pulp. A partial study, published on the Internet, of the family Caricaceae, with some very good photographs. Also, some notes on the Cherimoya.